It’s very important to understand the hair growth cycle in order to recognize and understand many of the problems you can encounter with your hair. The hair growth cycle consists of three distinct stages – anagen, catagen and telogen. Your hair grows around half an inch a month, and faster in the summer than in winter. The growth phase, or anagen phase, lasts an average of 3-5 years, so a full-length hair averages 18 to 30 inches. The anagen phase is generally longer in Asians, and can last as much as 7 years with hair being able to grow to 1 metre. At the end of the anagen phase, your hair enters the catagen phase. A short transitional phase that lasts approximately 10 days. 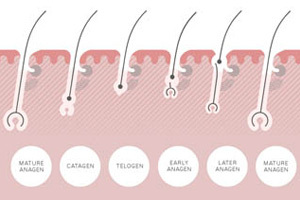 Lastly, your hair enters the telogen phase, a resting phase when your hair is released and falls out. The follicle then remains inactive for 3 months and the whole process is repeated. Each hair follicle is independent and goes through the growth cycle at different times, otherwise all your hair would fall out at once. Instead, you only shed a certain number of hairs a day – up to 80 hairs on a healthy head of hair. For instance, 6 weeks after restrictive dieting or a high fever you can experience telogen effluvium (diffuse hair fall). This occurs when your anagen phase is cut short and many hairs enter the telogen phase all at the same time. If your hair growth cycle is constantly challenged, or not supported, you may find that your hair won’t grow as long as it used to. This is because your hairs are never allowed to stay in the anagen (growing) phase long enough for your hairs to reach the desired length. 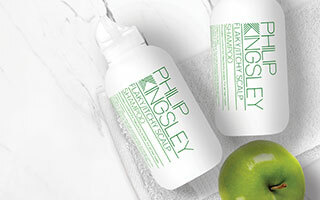 For more information on the hair growth cycle please contact our clinics based in London and New York who specialise in hair and scalp treatments.